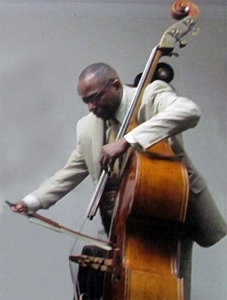 Darnell "Jay" Starkes, Double Bass Instructor, holds a Bachelor of Science and a Master of Arts Degree in Music from Lehman College. He is a teacher in the New Jersey school system. Mr. Starkes was born in Bermuda and he grew up in the South Bronx section of New York City. 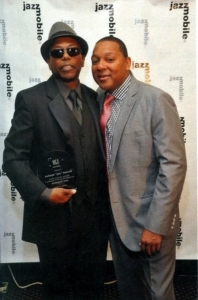 His musical influence is from his grandfather, and he has performed with such groups as The Bronx Symphony, Bill Lee's New Muse Bass Violin Choir, Jazzmobile Big Band, The Sonelius Smith Quartet, Abdul Zahir Batin and his Notorious Ensemble, and with The Charles Davis Quartet. 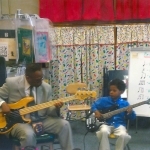 Mr. Starkes is a member of Lisle Atkinson's Neo-Bass Ensemble since 1988. JM: You have been an educator for many years. How old were you when you first took up the bass? How did you become a double bass player? DJS: 15. I began playing guitar at age 8. However I always liked the sound of the bass. Shortly after discovering the first four strings of the guitar was like the bass I saved my launch money and brought a bass guitar. JM: What was your musical atmosphere like when you were growing up? DJS: My parents were always playing music in the house. They also took my brothers and I to concerts. JM: Can you identify a turning point that made you realize you were going to become a professional musician? DJS: When I could show my grandfather the progress I have made on the instrument. JM: Which musician influenced you the most? What bass players, if any, have you been influenced by? DJS: My grandfather, Richard Davis, Buster Williams, Lisle Atkinson, Ron Carter, Ray Brown, and Stanley Clarke . JM: Tell us about the Jazzmobile Workshop? DJS: Jazzmobile was founded in 1964, by Dr. Billy Taylor and Daphne Armstrong to present, promote, propagate, and preserve America's only indigenous art form. JM: I see you are part of the Lisle Atkinson’s Neo Bass Ensemble. How did this ensemble come about? DJS: The Neo Bass Ensemble was founded by the renowned jazz bassist Lisle Atkinson. For the purpose of keeping music of the great American composers alive. The extraordinary aspect of this Ensemble is musicians execute performance like a big band . With the bass taking on the role of the horns. JM: Do you have a memorable project you worked on with your students? DJS: The hip hop blues project, with Gail and Akus Dixon. JM: What advice would you give a student preparing for a career in music? DJS: If there's something you're passionate about, it is important to surround yourself with people who have similar interests. AND NEVER STOP LEARNING.